Certified Organic Wheatgrass and Barley grass are one of nature's riches sources of vitamins, antioxidants, chlorophyll and essential amino acids. 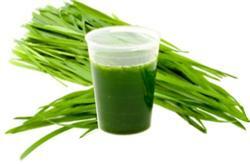 Wheatgrass (Triticum aestivum) is a popular constituent of vegetable and fruit juices and is made from the freshly sprouted baby shoots of wheat grains. Rich in antioxidants, iron, calcium, magnesium, vitamins A, C and E, chlorophyll and beta carotene, wheatgrass is believed to provide a natural remedy for a number of health related conditions. Being high in chlorophyll both Wheatgrass and Barley grass are alkaline in nature, which helps to promote digestive health. Some studies have also shown evidence that the consumption of Wheatgrass could be beneficial in treating high Cholesterol levels (Hyperlipidemia). Although more research is being published about the unique health benefits of Wheatgrass and Barley grass, some proponents suggest they may be used to fight off unwanted infection, enhance the appearance of skin and hair, lower blood pressure and suppress or moderate appetite (which helps people to lose weight). PINK SUN Certified Organic Wheatgrass and Barley grass provide a sweet natural green twist to any vegetable of fruit juice smoothie.